This post comes two months after we held our most recent panel discussion. We have an event recap and reflection. For photos please click here. On 9 June 2018, we held our most recent panel discussion, “Why girls should play sports: sports to enhance academic, health and wellbeing in life” at theDesk Leighton Centre. 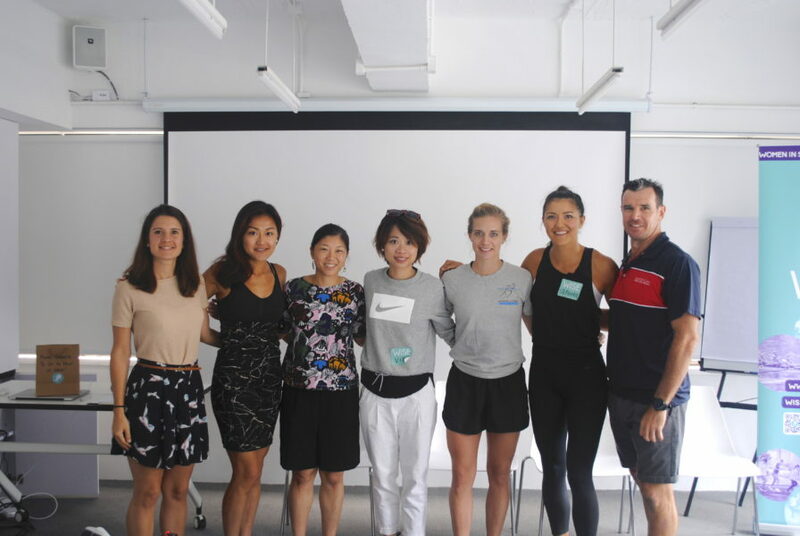 This topic is one that is very near and dear to us – because, as our name Women In Sports Empowered Hong Kong (“WISE HK”) suggests, we’re all about promoting sports for women and girls in Hong Kong – and naturally, we care a lot about getting girls involved in sports. Why do we care? It’s not simply because all of us at WISE HK play sports and love them, but it’s also because we know that sports matter. There is plenty of research that shows that sports can help with maintaining focus, reducing stress levels (as well as anxiety and depression) and improving our physical strength and conditioning. We know sports are empowering as they build our confidence, self-esteem and body image. Playing sports also teaches us crucial life skills such as teamwork, communication, time management, resilience and persistence — skills we need on a daily basis. Despite knowing these benefits, in Hong Kong, we’re not taking sports seriously enough. We don’t have a strong enough sporting culture that promotes a sporting mind set or fosters the integration of sports into our day-to-day. Playing sports helps build stronger communities but we don’t make the most out of what sports can bring us. Nor do we sufficiently acknowledge how playing sports can foster those leadership skills that are so valued in today’s world. Playing sports are especially important for our girls. In a recent study in the US of over 10,000 girls, it was found that girls who play sports report higher levels of confidence, often have higher grades than those who do not play sports and are 14% more likely to believe that they are smart enough for their dream career and 13% more likely to consider a career in mathematics and / or science. They are also 16% less likely to want to change their body image. We should be encouraging our girls to play sports. Unfortunately, in the high stakes academic environment of Hong Kong, it’s well known that schoolchildren are not spending enough time doing physical exercise, scoring low on overall physical activity levels and are found to spend les time outdoors than prisoners. In addition, playing sports feels particularly challenging for our girls. In our 2018 Women In Sports Empowered Hong Kong survey that explored women’s and girls’ experiences towards sports in Hong Kong, 77% of our under-18 year old respondents felt that women faced more challenges playing sports when compared to men. The biggest challenges they faced were: physical challenges (25%), sexism (18%) and lack of confidence (16%). The latter two statistics are alarming: our under-18s are twice more likely to report sexism and lack of confidence as challenges, compared to our other older age groups. Moreover, fewer opportunities to play in sports and fewer role models are challenges faced by 10% and 9% respectively of our under-18 respondents. In fact, for our under-18s, family, friends and role models are more important influencers to encourage participation in sports, with 29% of our under-18s saying so compared to 17% and 15% of our 19 – 29 year olds and 30 – 39 year olds respectively. Our results, while not necessarily representative of the whole of Hong Kong, are interesting because we can start to ask ourselves some interesting questions. For example, if lack of confidence is a barrier for girls compared to for boys when it comes to accessing sports, what can we do to enhance girls’ confidence and belief that sports is for them as much as it is for boys? If family, friends and role models are so important, how can we make role models more accessible, and how can we encourage family and friends to not be the ones who discourage girls from playing sports? This is important: first you can’t be whom you can’t see and if girls aren’t seeing the people around them taking sports seriously, why would they? 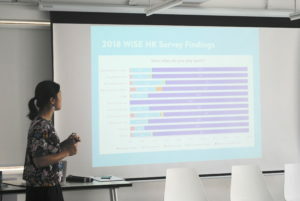 Secondly, through our interview series at WISE HK one thing we’ve observed is that it is the mothers who are often most reluctant to let girls – especially among our local families – take up sports more seriously. The two biggest reasons: 1) they don’t want playing sports to get in the way of academic performance; 2) they don’t want girls to get hurt or injured from playing sports. These two “reasons” are misconceptions about sports. How to increase access to all sporting opportunities available. 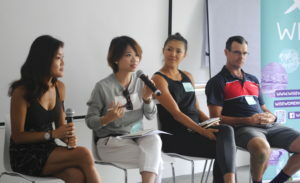 Vien shared that though academic pressures are still significant, there is more awareness for the importance of sports; as such, there is an upward trend where schools are encouraging students to take up sports through extra-curricular activities, and there have been more inter-school competitions that have attracted more sponsors and media coverage. We at WISE HK believe this is a positive sign and will have a knock-on effect: that sponsorship will attract even more resources being put towards sports and more media coverage creates more buzz. As to balancing sports for competition and sports for fun, James couldn’t agree more that there needs to be a place for both: for students who want to take sports seriously, and students who just want to play for fun. He’s encountered students who don’t want to compete against “star athletes” and requiring students who want to play sports for fun to compete against “star athletes” could have negative consequences. At the same time, James believes that students don’t get better if they don’t push themselves to go up against stronger competition. So it’s important to strike that balance and it’s the role of teachers and parents to help work through what that balance is. James has witnessed the positive effects of encouraging his female students to step-up: when they have no choice but to play a sport with the boys or when the younger girls have to play sports with the older girls because there aren’t enough sporting opportunities to cater to all age groups – they are empowering situations for girls. 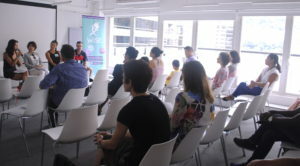 On this topic of competitive versus non-competitive sports, in our work at WISE HK, we have heard from some parents that sometimes they find it challenging to access sports and clubs outside of school that have programs that cater to children who have not yet developed a strong sporting acumen. They find that extra-curricular sports (in school and outside of school) too-often are tailored to children who already are good at a certain sport, and that because there are fewer sporting opportunities in Hong Kong, these sporting programs have the ability to pick and choose the “strongest” and “best” athletes, leaving behind those who aren’t considered good-enough. Once these children stop having access to sports and once they feel embarrassed or ashamed that they aren’t good enough for sports, they completely lose interest. As such, one question that we have is: how do we increase access to all types of sporting programs in Hong Kong that cater to the varying needs and skill levels of children, as well as expose them to the wide variety of sports that are available? Steph acknowledged the importance of role models to encourage girls to play sports. She was influenced by her two older sisters, as well as a teacher who was exceptionally encouraging. Playing extra-curricular sports at school and also for a club (adult) team taught her some of the skills that she still uses day-to-day — time management, being focused and maintaining productivity — skills harnessed from knowing as a student that she always only had a certain amount of time to do homework while fitting in sports and studying. It’s no surprise that playing sports enables Steph to stay involved and productive, and has shaped her path: studying exercise physiology at university, becoming a professional athlete with the Hong Kong Sports Institute and now opening her own gym studio while also volunteering at Love21 Foundation, an organization that helps children with special needs better their lives through activity and nutrition, and coaching netball. This led to a brief discussion as to why sports often aren’t perceived to be a viable career path in Hong Kong. Vien didn’t set out to be a sports journalist; in fact what she studied for her bachelors and masters were not sports-related but she ended up as a sports journalist because she loved sports and she enjoyed hearing the stories of the people who play sports. This not only sparked her curiosity to speak with athletes, but also to hear the stories of other sports journalists, and ultimately she initiated a project called “Chasing the Chase.” Admittedly it is not easy making a living as a sports journalist in Hong Kong, but Vien is passionate about what she does and sometimes that might be the most important factor to one’s career. Steph and James have had more “traditional” paths to working in the sports industry, and certainly their stories are inspiring to all of us – Steph using her sporting skills to enable her entrepreneurship journey, and James using his sporting skills as a PE teacher working daily to prepare children for their future. They are as much an entrepreneur and a teacher as someone who’s a tech entrepreneur or someone who teachers physics or French. Yet, too often we don’t encourage children to be a sports entrepreneur, or sports teacher. As we wrapped up the panel discussion, one mother in the audience posed this question: Why is it so challenging for her seven year old daughter who loves to play football and only wishes to be able to play more often, to find more opportunities to play? The mother noted, beyond school and the club where she plays at (where she can only play once per week), there are very few opportunities for her to do so. We’re saddened to hear this. Too often we hear this: girls who want to play sports, but find there are few opportunities in Hong Kong to do this. So the question we pose to you is: what can we all be doing to make sports more accessible and give our girls the opportunities they want to play? Are girls being held back from accessing sports in Hong Kong? If this is the case, and given the importance of sports to enhancing girls’ confidence and helping them to aspire to dream careers, how will lack of access to sports manifest throughout our girls’ lives, and impact their livelihoods? The thing is, there are numerous anecdotes globally on the benefits of sports for girls as they process to womanhood and professional careers. EY research on global senior female executives found that 94% of women in the C-suite played sport, including 52% at university level. And 74% said that a background in sport can help to accelerate a woman’s career. We now have the research that shows the benefits of playing sport goes beyond academic and health benefits. Indra Nooyi, CEO of Pepsi, played cricket in school. Christine Lagarde, who heads up IMF, as a teen was on the French synchronized swimming team. We couldn’t agree more with Cindy. Sports are a powerful agent for change. And we hope we can all work together to build up a stronger sporting culture for women and girls in Hong Kong, to use sports as a tool to build up the skills necessary to help us lead happy and productive lives and have fulfilled careers! Please do stay up to date via Facebook. We have some exciting Program and Activities upcoming and we’d love for you to be involved or participate!